These Easy Drunken Noodles, traditionally known as Pad Kee Mao are full of crisp veggies, tender chicken and a ridiculously flavorful sauce. Less than 45 minutes to make from start to finish! When it comes to Asian noodles, I think the first thing that comes to most people’s minds is classic lo mein, but there are SO many different versions out there that are equally delicious. I happen to lean more towards Thai food versus Chinese these days, and while there’s no shortage of scrumptious noodle dishes in that category, I find myself ordering the drunken noodles more often than any other. 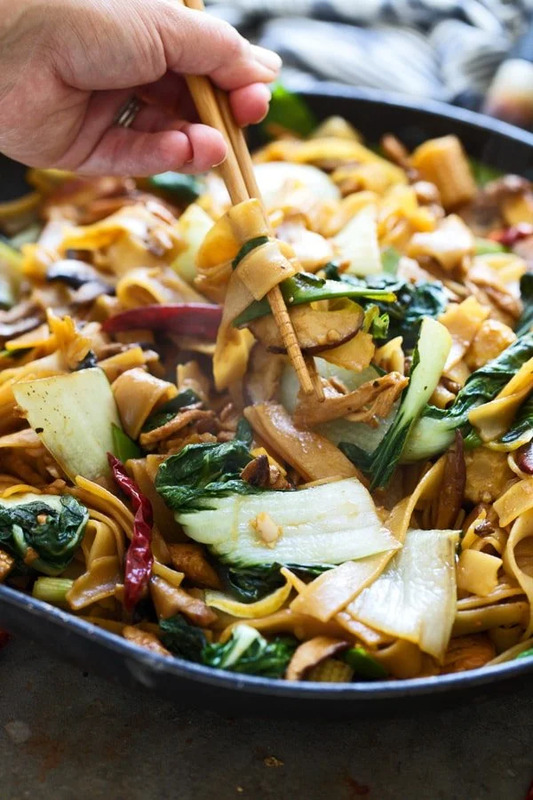 Aesthetically, the main differentiation between lo mein and drunken noodles is a wide rice noodle is used instead of a classic spaghetti-like egg noodle. I happen to love the way the wide noodles soak up a bit more sauce, and personally feel like they don’t fill me up as much as an egg noodles. If you’re having a hard time finding the wide noodles, you can substitute them with pad thai noodles, which tend to be easier to find at most grocery stores these days, but I highly encourage you to put in a little bit of elbow grease to find them. You can also order them here if you’ve called around and come up empty handed. 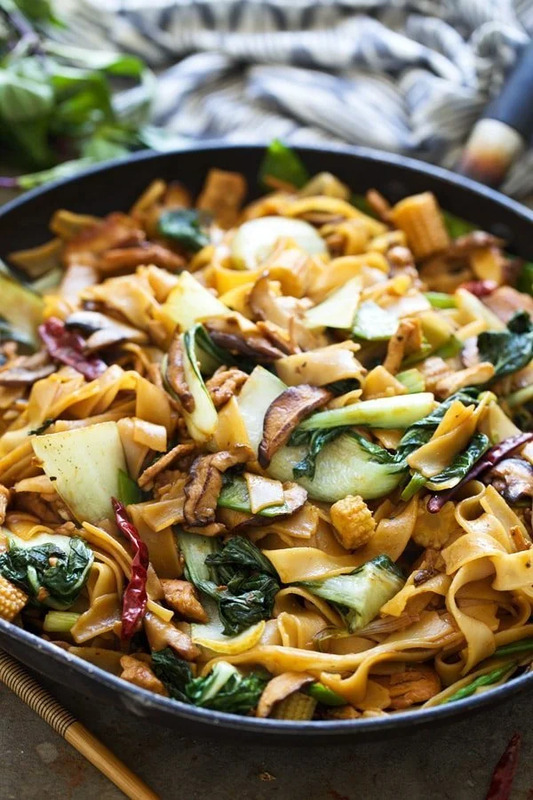 Drunken noodles also incorporate a little bit of brown sugar within the soy sauce and spicy thai chilies, which lends to a more sweet and spicy sauce that I adore. 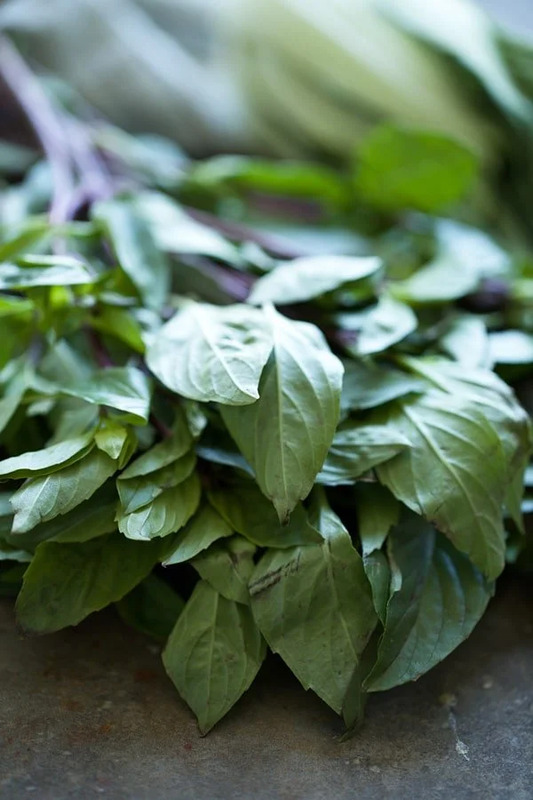 Unlike lo mein, there are a few harder-to-find ingredients that you must use in order to make it taste authentic – thai basil, dark soy sauce and thai chiles. You could probably get away with using a standard soy sauce and jalapenos if you really can’t find the dark soy (I used tamari) and thai chiles anywhere, but the thai basil is really irreplaceable. It has a stronger, less floral flavor than sweet basil that fits perfectly with the spicy chiles, sweet soy sauce and crisp veggies. I decided to forgoe the grocery store search and hop on over to our closest Asian market which had everything I needed. These days, you should easily be able to find a fully-stocked Asian market in your neck of the woods. Similar to any stir-fry or noodles dish, you want to work in batches. First, you stir-fry the chicken, followed by the veggies, and then add everything, including the noodles and the sauce back in to the pan to finish cooking. In this version, I used bok choy, baby corn, snow peas and plenty of shitake mushrooms, but honestly you can use whatever combination of vegetables suits your taste. 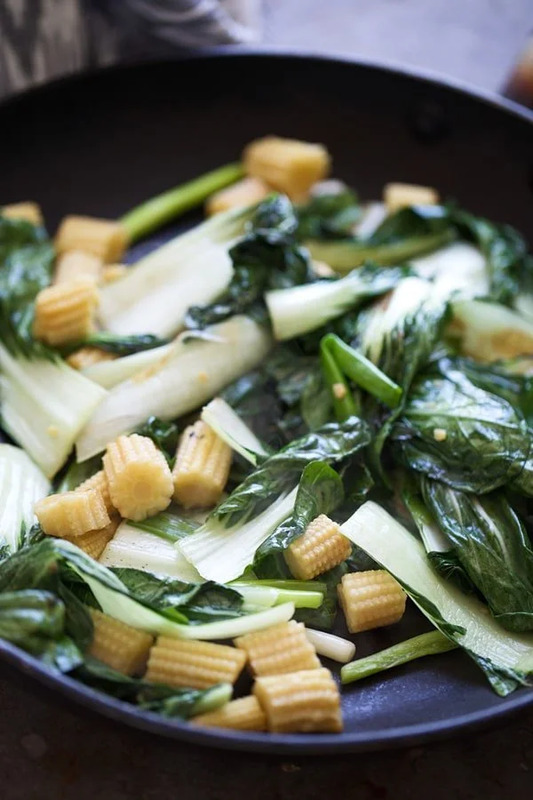 Chinese broccoli, thinly sliced carrots, red peppers or even some napa cabbage would also work wonderfully. Once the chicken is cooked through, the veggies are soft, but still crisp and the noodles are aldente, everything is tossed back in to the hot pan along with the sauce mixture of soy, brown sugar, oyster sauce, a touch of fish sauce and a little bit of water. The whole dish is tossed together, it’s seasoned with a touch of salt and pepper and ready to be served. I like to serve it a little untraditionally with srirracha for a little bit of an extra kick, but you could also use a spicy thai chile sauce or whatever you’ve got on hand. Use a very sharp knife to cut the chicken as thin as possible. Add to a small bowl along with a tablespoon of soy sauce. Toss to combine and set aside while you prepare the rest of the veggies. In a bowl, whisk together remaining soy sauce, tamari, water, brown sugar and oyster sauce. Heat a large saute pan or wok to a high heat. Add one teaspoon of olive oil and one teaspoon of sesame oil. Once the oil is smoking, add boy choy and snow peas. Stir-fry until soft, but still crisp, about 2-3 minutes. Remove from pan and set aside on a plate. Add noodles to the boiling water, cook until aldente. About 7-10 minutes. Return pan to stove and add another teaspoon of olive oil and sesame oil. Add mushrooms, baby corn and garlic. Stir-fry until soft, about 2-3 minutes. 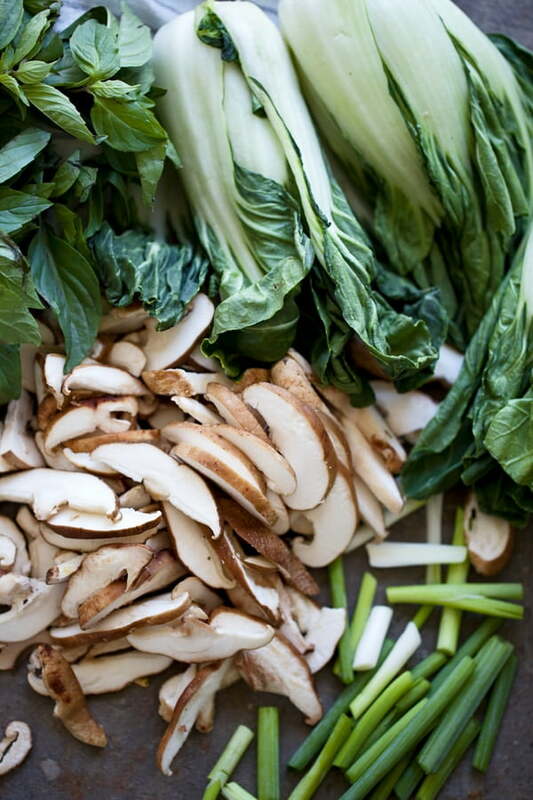 Remove from pan and set aside with boy choy and snow peas. (If needed, rinse the pan clean) Return pan to stove and add the last teaspoon of olive oil and sesame oil. Add chicken, stir-fry until chicken is cooked through, about 3-4 minutes. If using eggs, move the chicken to the side and add the eggs, scramble. Add the veggies back to the pan along with the cooked rice noodles, the sauce, chiles and thai basil. Toss everything together and continue to cook for another 2-3 minutes until everything is coated and noodles are cooked a little bit more. If needed, add another 1-2 tablespoons of pasta water to loosen sauce up. If necessary, season with salt and pepper. 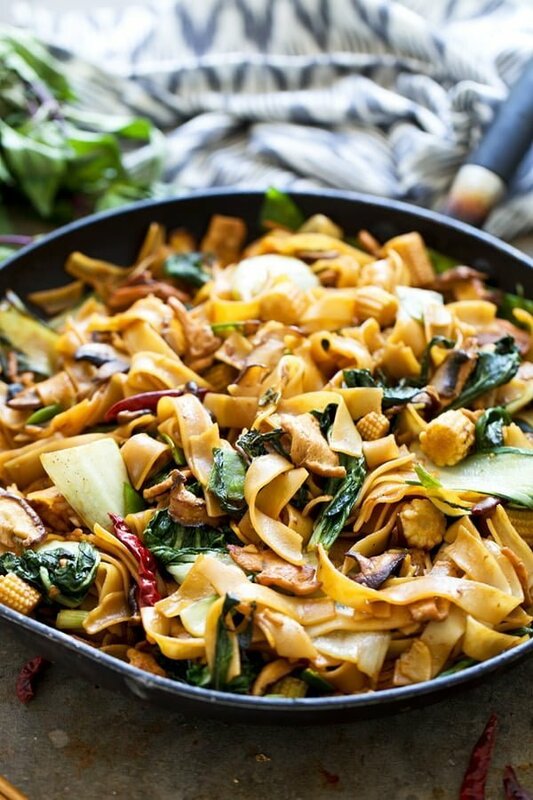 13 Responses to "Easy Drunken Noodles (Pad Kee Mao)"
This looks great. Where is the actual recipe. Not included in this post, or at least i can not find it. I forgot to add it at first! Updated! So sorry Dan. I forgot to add it! Updated! These sound soooooo tasty! Nothing better than a big bowl of noodles! I love this recipe! It looks very yummy! Best Portable Induction Cooktop. I will try at home with my cookware! Thanks for sharing! 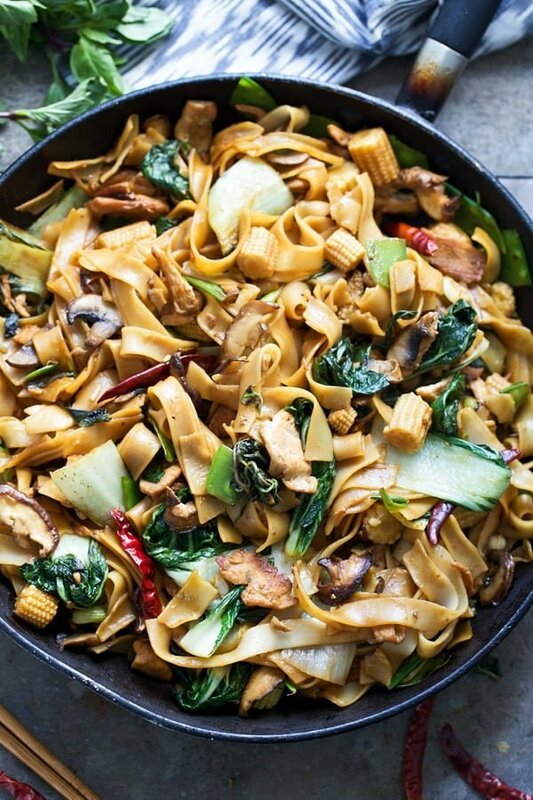 While as is, this sounds amazing, I’m curious, without any alcohol in the sauce, why is this called “drunken noodles”? Seriously… just curious.